A significant proportion of ocular trauma occurs in the workplace 2 and is more likely to affect young males 3. Eye injuries complicate 2.3 % of all major traumas and are frequently missed on secondary and tertiary surveys 4. Accurate assessment and appropriate management of eye injuries in the Emergency Department are essential. Ngrel, AD & Thylefors, B. (1998). The global impact of eye injuries. Ophthalmic epidemiology. 5. 143-69. The epithelium is composed of stratified squamous epithelium which is fast growing and easily regenerated. It also contains large numbers of nerve endings which account for the extreme sensitivity of the cornea to touch. Injury to the epithelium disrupts the air- tear film interface that is responsible for the majority of the refractive power of the eye, and thereby leads to reduction in visual acuity. 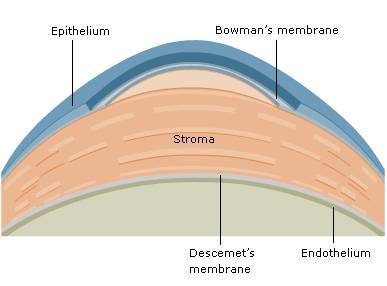 The epithelial basement membrane is composed of collagen fibres making it relatively tough and an anchor for epithelial cells when healing is occurring. The stroma forms approximately 90% of the thickness of the cornea and is predominantly formed of collagen and water. The relatively strong endothelial basement membrane forms a barrier to the inward spread of infection and injuries. The endotheliums main function is to regulate the leakage of aqueous humour from the anterior chamber into the stoma. Corneal abrasions result from scratching, cutting or abrading the protective epithelium of the cornea. After a minor abrasion, healthy cells quickly fill the defect and prevent infection or irregularity in refraction. Deeper penetration of the cornea results in the healing process taking longer from 24 to 72 hours 5,6. Corneal abrasions mostly are traumatic but can be spontaneous and recurrent. 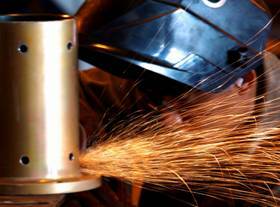 Small metallic foreign bodies can come into contact with the eyes, most commonly when someone is drilling or grinding a metal surface. Special attention should be paid to the identification of a corneal rust ring. Iron in its neutral form is relatively insoluble in the corneal layers 7. However, over time a metallic foreign bodys surface oxidises and diffuses into the stroma. A rust ring is then formed by the combination of oxidised iron and cellular infiltrate at the level of the superficial stroma. A rust ring can lead to permanent corneal staining, chronic inflammation, corneal vascularisation and necrosis and therefore should be removed within a few days of it being identified 8,9. This condition arises from intense or prolonged exposure of the cornea to ultraviolet light, most commonly from welding (arc eye), sunlamps or reflected sunlight from snow (snow-blindness). The ultraviolet light irritates the corneal epithelium, triggering an inflammatory response with oedema and congestion developing into a superficial keratitis. Chemical injuries represent 7-10% of all eye injuries presenting to the Emergency Department 10. Acid and alkaline solutions may cause corneal burns as can aerosol preparations such as pepper spray or CS spray. Chemical burns by alkaline solutions have the worst prognosis because they are able to penetrate the tissues quickly 11, whereas acidic solutions cause more superficial injuries. One should be alert in cases of a painless eye as there may be severe contamination. 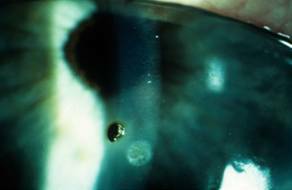 In the acute stage, chemical burns induce epithelial defects, corneal oedema, and ischaemic necrosis of the limbus, conjunctiva, iris and ciliary body 12. 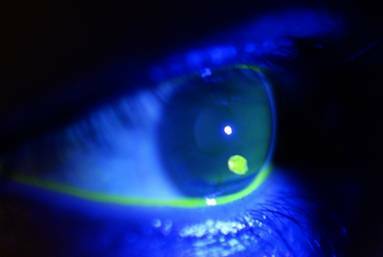 The diagnosis can be confirmed by examining the cornea under cobalt-blue light following the application of fluorescein. If clinical examination is limited by pain, topical anaesthetic can be instilled. Proxymetacaine has been shown to produce the lowest pain score of all topical anaesthetics and regarded as the agent of choice for the examination of the injured eye 13. Corneal abrasions appear green under florescent light after the application of fluorescein. Patients will not always recall a foreign body having entered the eye so it is important to have a high index of suspicion and examine for a conjunctival or corneal foreign body if a patient presents with an uncomfortable red eye. Local anaesthetic may be needed both to examine the eye and to remove any foreign body Proxymetacaine has been shown to be the optimal agent 13. The foreign body can usually be easily visualised although clues as to its position may be gained by pooling of administered fluorescein around the foreign body and /or the presence of conjunctival injection adjacent to it. If there is a history of a possible foreign body entering the eye and it cannot be seen then the eyelid must be everted to exclude a subtarsal foreign body, provided a penetrating injury is not suspected. If a subtarsal foreign body is present, it is easily removed using a cotton bud. Also, where the history is of a high velocity foreign body (e.g. metallic fragment from angle grinding or hammering a metal chisel) the possibility of a penetrating injury with intraocular foreign body must be considered. For more information on this topic please refer to the session on Penetrating trauma to the eye. Ultraviolet light exposure can cause superficial keratitis. 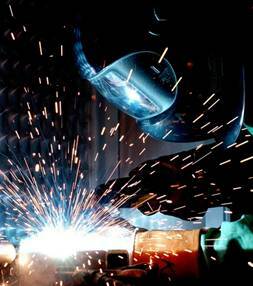 Welders, skiers and people who use sunbeds without eye protection are most commonly affected. Symptoms occur several hours after exposure and include blepharospasm, photophobia, watering and pain. Local anaesthetic, whilst providing good relief from pain, allows for examination with fluorescein staining. 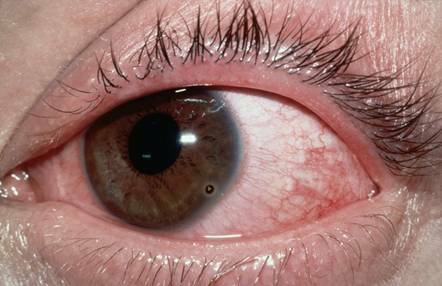 The most common finding on examination is generalised conjunctival injection with multiple punctate lesions on the cornea. Patients usually present with a history of being splashed or sprayed in the eye(s), either accidentally or with a liquid chemical or CS spray or pepper spray. Assessment is usually very difficult due to reflex tearing and blepharospasm. The use of a local anaesthetic will ease pain and aid assessment which may need to follow the immediate priority of eye irrigation for liquid chemicals. Airbag deployment can cause chemical burns and eyes to be examined for abrasions in air bag deployments. Scarlett, Angela, and Paul Gee. Corneal Abrasion and Alkali Burn Secondary to Automobile Air Bag Inflation. Emergency Medicine Journal: EMJ 24.10 (2007): 733734. PMC. Web. 2 Sept. 2018. 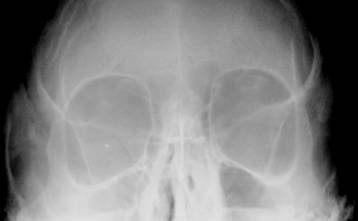 Radiological investigation of the orbit may be needed if an intraocular metallic foreign body is suspected from the history or examination (see the penetrating injuries of the eye session for further information). X ray, ultrasound and CT scanning may all be used local protocols should be followed. Eye pads, mydriatics, lubricants and topical antibiotics have all traditionally been used in the management of corneal abrasions. The evidence for such treatments has been reviewed extensively in recent years. In actuality most corneal abrasions will heal effectively with a treatment plan that utilises topical antibiotics and topical/oral analgesics alone. 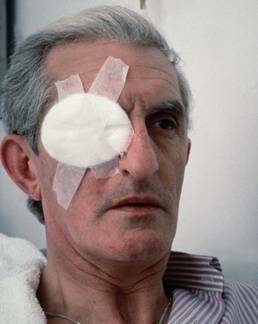 Eye pads were traditionally advocated for the management of corneal abrasions in order to protect the damaged cornea from further damage from eyelid-induced trauma. Meta analysis of five Randomised Controlled Trials (RCTs) demonstrated no increase in healing rate of corneal abrasion or improvement on a pain scale, for patients treated with eye pads vs. those that were not 14. Subsequent RCTs have reported similar results 6,15. Eye pads themselves have been shown to be the cause of pain in nearly half of all patients 16 and can result in higher rates of infection and impair the healing process 17,18. The use of patches has also been shown to lead to a loss in binocular vision 19. Mydriatics, such as tropicamide and cyclopentolate, were traditionally advised to relieve ciliary muscle spasm that was thought to occur in patients with corneal abrasions. One RCT compared the use of a mydriatic and a lubricant, with lubricant alone, in a sample of 400 patients with corneal abrasion. The results showed no difference in pain score over a 24 hour period and the use of oral analgesia 20. Topical corticosteroids have been shown to slow corneal epithelial and stromal healing, increase the risk of infection, and cause serious scarring and visual loss if a dendritic ulcer has been missed 21. Complications of simple corneal abrasions are rare. However, poor adhesion of corneal epithelium to the basement membrane following an abrasion, may lead to the development of a recurrent corneal erosion (RCE). Symptoms of RCE include a foreign body sensation, ocular pain, lacrimation on awakening or after rubbing the eye, blepharospasm and photophobia. On examination there is fluorescein uptake at the site of a previous abrasion. Lubricants have traditionally been advocated to prevent recurrent symptoms and RCE following uncomplicated traumatic corneal abrasion. There is however a paucity of good evidence to support this. One small non-blinded study actually demonstrated a higher prevalence of symptoms post corneal abrasion in the cohort treated with lubricants as well as standard therapies 23. Topical non-steroidal anti-inflammatory drugs (NSAIDs) such as diclofenac and ketorolac have been show to be modestly useful analgesics in corneal abrasion 24 (( . A systematic review of five RCTs showed that topical NSAIDs decreased pain by an average of only 1.3cm on a standard 10cm scale 25. Patients using topical NSAIDs may take fewer oral analgesics (two of three studies) and return to work earlier (one study). 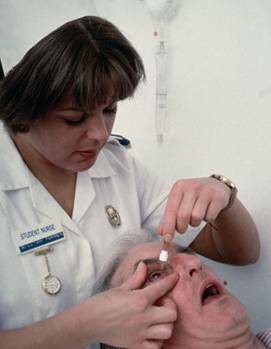 Diclofenac eye drops are licensed to treat pain after a corneal abrasion in the UK but there is a lack of evidence to compare the efficacy of topical NSAIDs with oral preparations. There are no case reports in the literature of clinical tetanus developing from a simple corneal abrasion. Unlike skin, corneal epithelium does not have an underlying blood supply (receiving nutrients from the aqueous humour) and often shows substantial healing within 6 hours of injury. A study using an animal model failed to induce tetanus following inoculation of a corneal abrasion 26. There is no strong evidence to support the use of prophylactic antibiotics to reduce the risk of concomitant infection in corneal abrasion. One cohort study of topical antibiotic prophylaxis for corneal abrasion showed a lower risk of ulceration if 1% chloramphenicol eye ointment was used, especially if the treatment was started within 18 hours of the initial injury 27. Fusidic acid eye drops have not been shown to be more efficacious than chloramphenicol eye ointment in the management of corneal abrasion 28. There is no good published evidence that eye ointment is better than eye drops for preventing infection following corneal abrasion. However, expert consensus is that eye ointments are preferred because they are thought to be more lubricating 29. In patients who wear contact lenses an anti-pseudomonal antibiotic (e.g. gentamicin / ofloxacin /ciprofloxacin) should be used and contact lens use discontinued. It is recommended that contact lenses are avoided until the antibiotic course is completed and the abrasion is healed 30. Following instillation of local anaesthetic, small loose conjunctival foreign bodies can be washed out with water or removed with a cotton bud. If the foreign body is adherent or embedded in the cornea, a needle may be used to lift it out of the cornea. This must be done either using a slit lamp or loupes to ensure accuracy and minimal damage to the cornea. Once the foreign body has been removed any remaining epithelial defect can be treated as an abrasion. Rust rings can be removed either by a needle or by ophthalmic burr. Studies have shown that it can take up to twice as long to remove a rust ring with a needle as it does with a burr 31. It may be easier to remove rust rings 2 -3 days after presentation as local necrosis will separate the rust ring from the corneal epithelium 31. The mainstay of management of an ultraviolet burn to the cornea is pain relief. Topical and oral analgesics such as NSAIDs may be used and a mydriatic may be helpful for photophobia due to ciliary muscle spasm in more severe cases. 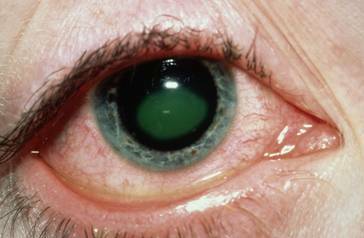 A single dose of cyclopentolate instilled in to ED will dilate the pupil for up to 24 hours, by which time the ultraviolet burn will normally have healed. If a mydriatic is used, the patient must be warned about blurring of vision and advised not to drive until the eye(s) have returned to normal. Eye lubricants and Topical antibiotics helps to prevent infection while cornea heals. The recommended treatment for liquid chemical splashes to the eye is prompt irrigation with copious amounts of water or normal saline 32. The earlier initial irrigation of the eye begins has the greatest influence on the prognosis and outcome of chemical burns 33. There is no good data to support the role of water as the most appropriate irrigation fluid for the management of chemical burns to the eye and current expert consensus is that normal saline should be used for eye irrigation following chemical splashes and burns 34,35. Litmus paper should be used to judge the response to irrigation, which can be stopped when the pH returns to neutral (pH 7.0 7.3) 36. Following irrigation the eye(s) should be stained with fluorescein. If fluorescein uptake is demonstrated, referral to an ophthalmologist is recommended although local policy should be followed. CS Spray or o-chlorobenzylidene malonitrate is largely in use by police forces as a chemical incapacitant spray. In its aerosol form CS is dispersed as a fine dust and produces side effects including ocular symptoms such as lacrimation, blepharospasm, erythema of the conjunctiva and periorbital oedema occur. Irrigation can worsen the symptoms as CS is highly soluble in water. 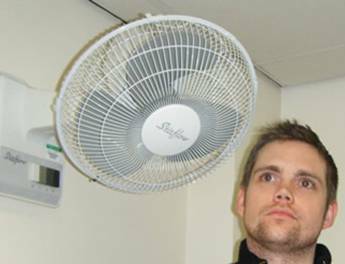 Expert opinion suggests that he best way to manage corneal injuries resulting from CS spray is to place the patient in a well ventilated area and use a fan to blow air directly across the eyes 37, ensuring no cross contamination occurs with others in the vicinity. There is no clear consensus in the literature regarding the most appropriate arrangements for review and follow up of patients with corneal abrasion. Expert opinion advocates follow up for all cases of corneal abrasion, with examination using fluorescein stain, after 24 hours 29,38. General practitioners and emergency nurse practitioners have been identified as suitable professionals to manage follow up in uncomplicated cases of corneal abrasion. 5. Dua HS, Forrester JV. Clinical patterns of corneal epithelial wound healing. American Journal Ophthalmology 1987;104:481-9. 6. Le Sage N, Verreault R, Rochette L. Efficacy of eye patching for traumatic corneal abrasions: a controlled clinical trial. Annals of Emergency Medicine 2001;38:129-34. Zuckerman BD, Lieberman TW. Corneal rust ring. Archives Ophthalmology 1960;63:254-65. Nagendran T. Management of foreign bodies in the emergency department. Hospital Physician. 1999;35: 27-40. Flynn CA, DAmico F, Smith G. Should we patch corneal abrasions? A meta-analysis. Journal Family Practice 1998;47:264-70. Michael JG, Hug D, Dowd MD. Management of corneal abrasion in children: a randomized clinical trial. Annals Emergency Medicine 2002;40:67-72. Arbour JD, Brunette I, Boisjoly HM, Shi ZH, Dumas J, Guertin C. Should we patch corneal erosions? Archives Ophthalmology 1997;115:313-7. Campanile TM, St Clair DA, Benaim M. The evaluation of eye patching in the treatment of traumatic corneal epithelial defects. Journal Emergency Medicine 1997;15:769-74. Carley F, Carley S. Towards evidence based emergency medicine: best BETs from the Manchester Royal Infirmary.Mydriatics in corneal abrasion. Emergency Medicine Journal 2001;18:273. Weaver CS, Terrell KM. Evidence-based emergency medicine. Update: do ophthalmic nonsteroidal anti-inflammatory drugs reduce the pain associated with simple corneal abrasion without delaying healing? Annals Emergency Medicine 2003;41:134-40. Upadhyay MP, Karmacharya PC, Koirala S, Shah DN, Shakya S, Shrestha JK, et al. The Bhaktapur eye study:ocular trauma and antibiotic prophylaxis for the prevention of corneal ulceration in Nepal. British Journal Ophthalmology 2001;85:388-92. Boberg-Ans G, Nissen KR. Comparison of Fucithalmic viscous eye drops and Chloramphenicol eye ointment as a single treatment in corneal abrasion. Acta Ophthalmologica Scandinavica 1998;76:108-11. Weissman BA. Care of the contact lens patient: reference guide for clinicians. St. Louis: American Optometric Association, 2000. Sigurdsson H, Hanna I, Lockwood AJ, Lonstaff S. Removal of rust rings, comparing electric drill and hypodermic needle. Eye 1987;1:430-2. Kuckelkorn R, Kottek A, Schrage N, Reim M. Poor prognosis of severe chemical and thermal eye burns: the need for adequate emergency care and primary prevention. International Archives Occupational Environmental Health 1995;67:281-4. Blais BR. Treating chemical eye injuries. Occupational Health Safety 1996;65:23-6. Aslam, S.A., Sheth, H.G. and Vaughan, A.J. (2007) Emergency management of corneal injuries. Injury 38(5), 594-597.